In December 2013, Belgium adopted a National Plan for Rare Diseases. The NP had no fixed start/end date, and can thus be assumed to be ‘active’. The NP receives national funding, to the amount of €15 million per year. Implementation of NP is overseen by a Steering Group for Rare Diseases, which is described as ‘partially functioning’ (in the sense that it meets infrequently and does not yet involve all stakeholders). To-date, the Plan has resulted in notable successes, including the following: the formation of a legal framework supporting the organisation of rare diseases; the development of a quality system for use in genetic centres; the creation of a central registry for rare diseases; and introduction of Orphacodes within genetic centres. In terms of care organisation for people with RD, Belgium has established both a national and regional designation process for Centres of Expertise (CEs). In addition, a legal framework for CEs and networks for RD was established in August 2014, under which CE recognition/designation is a shared federal and regional responsibility: 7 University hospitals have received this recognition thus far, and it is planned that in future, specific CEs will be designated (at disease/disease area level). Belgium participates actively in European Reference Networks (ERNs); currently, 10 HCPs participate as full members of 23 ERNs in total. Belgium is exploring how best to integrate people with RD to social policies and services; for instance, continuous care will be provided more effectively through the introduction of case managers and resource centres (essentially ‘one-stop-shop’ style social services) for RD – these are not yet operational, but plans are taking shape and budget has been allocated. Genetic testing is carried out exclusively by 8 Centres for Human Genetics, whose operational standards are established by a Royal Decree. In Belgium, neonatal screening is a regional/community specific responsibility, organised by the authorities of those regions. For example the Flanders region screens for 11 neonatal conditions whilst the French community screens for 13 conditions. Alongside regional level and disease-specific registries, Belgium has had a national registry (Central Registry for Rare Diseases) since Dec 2013, to which 8 genetic centres now contribute data. The Central Registry now uses the OrphaCode alongside other coding systems. Belgian authorities provide several official ‘information sources’ for RD: a National Orphanet team operates from the Scientific Institute of Public Health; the national alliance of patient organisations, RaDiOrg, provides a helpline for both patients and medical professionals. 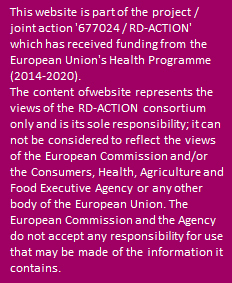 There are no specific research projects or programme for RD; however, Belgium does participate in E-Rare. As of November 2016, 78 Orphan Medicinal Products were available in Belgium. Specific approvals are in place for pricing and reimbursement, and there are incentives supporting research and development into OMPs.